A recent answer on this site says that "People have always prayed to Mary as a chief intercessor on their behalf." Such a statement will surely seem excessive to Protestants, who would normally characterize the idea of Mary interceding for the living as a (negative) development that took place centuries after Christ. I doubt that debate will get resolved here, but it still makes me wonder – what is the earliest known instance of a petition directed to Mary? I am looking for a clear statement where Mary is the actual target of a petition, not that she is tangentially referenced in association with a petition. I'm not looking for statements of praise directed at Mary. Notice however that this quote lacks two things that I'm looking for in answers – it doesn't specify that the prayers were petitions, and it doesn't state the documents in which these prayers were recorded. We have a similar question, When is the first documented case of Christians praying to the dead saints? However it does not specifically address the question of prayer to Mary, and though Mary is mentioned several times in one answer, she is only praised, never petitioned, in the prayers quoted there (such as from the Liturgy of St. James). It is called in Latin Sub Tuum Presidium, and in Greek (in which it was originally written, or thought to have been written) it is called Ὑπὸ τὴν σὴν εὐσπλαγχνίαν (hypo ten sen eusplangnian)—both of which mean 'Under Thy Patronage'. Beneath your compassion, We take refuge, O Mother of God: despise not our petitions in time of trouble: but rescue us from dangers, only pure, only blessed one. Sub tuum praesidium confugimus, Sancta Dei Genetrix. 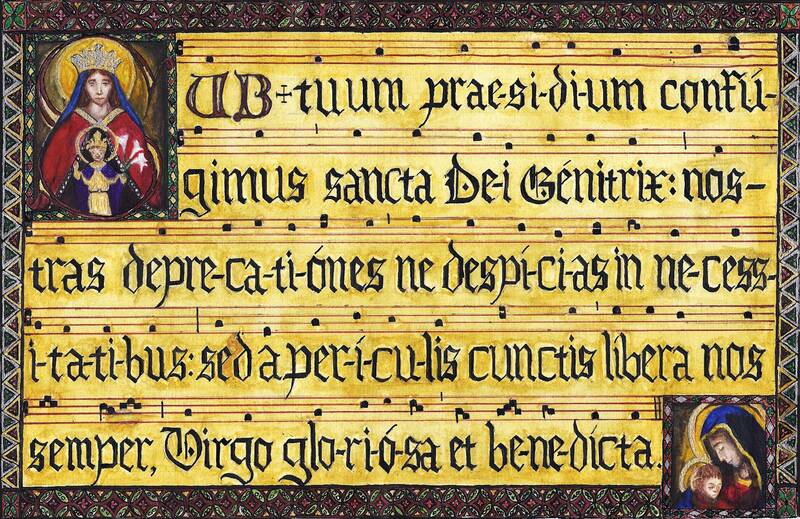 Nostras deprecationes ne despicias in necessitatibus [nostris*], sed a periculis cunctis libera nos semper, Virgo gloriosa et benedicta. Amen. * Latin for 'our'—retained since some versions contain this. As you can see it asks the Blessed Virgin Mary to not despise our petitions, which means she is the object of their petitioning. The petition is a general one, i.e. to listen to any petition to her, whatever they are (compare this to the prayer Memorare, which bear resemblance to this ancient prayer). Keep in mind the earliest manuscript evidence for the New Testament is a papyrus dating to A.D. 117-138 (named P52), and that this papryus predates the Ecumenical Council of Ephesus (A.D. 431), which made the reality of Mary's being the Theotokos a dogma of the faith, by almost two centuries. Not the answer you're looking for? Browse other questions tagged church-history prayer virgin-mary origin intercession-of-saints or ask your own question.